Q & A with the Curators/Authors of ¡Murales Rebeldes! L.A. Chicana/o Murals under Siege – ¡Murales Rebeldes! How did ¡Murales Rebeldes! come about? Erin M. Curtis: LA Plaza de Cultura y Artes and the California Historical Society had the opportunity, along with 70 participants across Southern California, to participate in the Getty’s region-wide initiative, Pacific Standard Time: LA/LA, which creates a dialogue between Latin American art, Latino art, and Los Angeles. Jessica Hough, on behalf of CHS and LA Plaza, initiated the idea of a project that explored the contributions of Chicana/o muralists to the region’s history, art history, and public art. This resulted in the ¡Murales Rebeldes! exhibition and publication. I joined the project at an early stage, when I was hired as Senior Curator at LA Plaza. As a historian of Los Angeles, I was immediately taken with the ways that Chicana/o murals depict histories of the city that aren’t often told in more official contexts and wanted to explore how and why these histories became targets of backlash. Jessica Hough: I had been doing a lot of thinking about América Tropical, David Alfaro Siqueiros’s mural on Olvera Street, which is just a stone’s throw from my office window. The controversial mural was whitewashed just a short time after it was painted. I liked the idea that we might initiate a project that looked at the mural’s impact on generations of artists and the murals that have emerged in its wake. As I began to dive deep into L.A.’s Chicana/o murals, I was amazed at how many artists had referenced Siqueiros’s mural visually in their work, even though when they painted their murals América Tropical still sat beneath layers of whitewash! I also began to realize just how many Chicana/o murals had suffered a similar fate. That’s when I knew we had a project, and I couldn’t wait to understand more. After reading Guisela Latorre’s book, Walls of Empowerment: Chicana/o Indigenist Murals of California, I reached out to her for her opinion. She was sold on the idea. Guisela Latorre: In the epilogue of my book Walls of Empowerment, I wrote about the unsurmountable challenges Chicana/o muralists faced at the close of the twentieth century. The country’s conservative backlash had led to a decrease in mural commissions and a lack of funds for conservation. When Jessica contacted me about her idea for a new project about Chicana/o murals, I was eager to participate. The project gave me an opportunity to see what had happened to Chicana/o murals since my book was published. I was surprised to learn just how systematic and widespread the destruction and disappearance of Chicana/o murals in Los Angeles had become. Why did Los Angeles become such an important city for murals? EC: Los Angeles was once the mural capital of the world. There were about 2,000 murals made in L.A. during the 1960s and 1970s, an era that coincides with the Chicano Civil Rights Movement. A majority of the murals painted during this time were created by Chicana/o artists. In fact, the Chicano Art Movement also began during this time in Los Angeles and all over the Southwest. JH: Chicana/o art was a key component of the Chicano Civil Rights Movement, and Los Angeles was a center of the Chicana/o movement, along with other cities in the Southwest. Chicana/o art reflected the movement’s emphasis on Chicana/o pride, history, and heritage, and the unequal treatment of Mexicans and Mexican Americans. I also think that the sprawl of our city, the spaces between buildings, and the vast expanses of concrete make L.A. a perfect canvas for artists. GL: Art historian Shifra Goldman wrote that the West Coast led the country in the quantity of murals. Some of them were created as part of the Works Progress Administration during the Depression, which gave artists work opportunities to create public art, including murals. During this time, though, many artists here were influenced by leading Mexican artists of the Mexican Mural Movement, which began around the 1920s. Diego Rivera, David Alfaro Siqueiros, and others brought their social and political perspectives to Los Angeles. They showed Chicana/o artists that wall paintings could communicate social justice messages in very powerful ways. It seems as though Mexican and Chicana/o murals always caused controversy in Los Angeles. Why? EC: Controversies around Los Angeles murals extend as far back as 1932, when the famous Mexican muralist David Alfaro Siqueiros painted América Tropical in the Mexican-themed marketplace of Olvera Street. The people who commissioned the mural requested it to reflect the benign theme of “Tropical America” as part of Olvera Street’s commercial appeal. But Siqueiros had other ideas. He wanted to show the realities of American imperialism and its effects on indigenous populations. When the mural was unveiled, viewers were surprised to see a graphic depiction of the crucifixion of a Mexican Indian on a cross crowned with an American eagle. América Tropical was considered dangerously anti-American and was whitewashed within a few years of completion. Interestingly, it isn’t the only Siqueiros mural whitewashed in Los Angeles. His mural for the Chouinard School of Art, Mitin Obrero (also known as Workers’ Meeting or Street Meeting), was whitewashed in 1932 due to its political content. JH: Like América Tropical, many people felt threatened by the murals that were created during the Chicano Civil Rights Movement. Like Siqueiros, Chicana/o muralists of the 1960s and 1970s used their art to express their frustrations, dreams, hopes, and grievances against a society they viewed as largely oppressive. At a time when Chicanas/os had limited outlets of communication, murals served as a newfound form of artistic expression and community building.These murals were, in a sense, an artistic “call to action” for Chicanas/os to take pride in their identity and to protest for equality. But as we learned from our research, not all murals were destroyed for political reasons. Some were simply undervalued or misunderstood. GL: Chicana/o artists exposed social inequality and discrimination in direct and unapologetic ways.They also believed that their culture and history needed to be celebrated and recognized as an important part of U.S. history. So it’s not surprising that many would oppose the ideas Chicanas/os presented in these murals. These artists did not necessarily object to disagreements with their messages; they welcomed dialogue. Yet, many of their murals were whitewashed, neglected, censored, and even destroyed. Their artistic and social messages are now lost. Recovering their histories—despite their sometimes controversial messages—is important to understanding and telling the history of Los Angeles. How did you come up with the idea to focus on murals “under siege”? EC: We wanted to find out why so many Chicana/o murals had ceased to exist over the past few decades. We assumed that most of these wall paintings had been censored and eventually destroyed as a result of their contested nature. What we encountered over the course of our research, however, was far more complex. While many murals had been deliberately destroyed or whitewashed due to their supposedly subversive or threatening content, many had been made to disappear in less conspicuous ways. JH: The ¡Murales Rebeldes project gave us a chance to research and write about murals that have been lost while we still had the benefit of being able to talk to the artists who made them and connect with others from the community involved in the execution of them. The longer the murals are gone, the further away in memory they slip. Our project really tries to revive these works of art so that we can insert them into their proper place in art history and social history. GL: To be “under siege” can mean to be in a vulnerable position or to become a target of attack. We discovered that Chicana/o murals in Los Angeles were under siege for various reasons, including passage of anti-graffiti laws and the 2002–2013 citywide mural ban. But we also considered the role of our legislature in providing opportunities for mural preservation and conservation. Today some organizations are helping muralists by preserving their art. But the road ahead is still not clear. The ¡Murales Rebeldes! book ends with a call to action by Gustavo Arellano—editor of OC Weekly and author of ¡Ask a Mexican!—urging individuals, communities, and organizations to make greater efforts to preserve this artform for Chicana/o artists and communities; to him, indifference is also to blame for the disappearance of Chicana/o murals. How did your backgrounds influence the content of the ¡Murales Rebeldes! publication and exhibition? EC: Each of us brought her own experiences and approaches to the project. As a historian of Los Angeles—a city with a contested past and ongoing struggles over space and place—I am deeply interested in questions about who has the right to tell history and who has the right to occupy public space. I want to examine how these questions have manifested themselves continually throughout the city’s history. Through my research, I have come to see murals as metaphorical extensions of Chicana/o communities and even Chicana/o bodies, bearing public witness to personal and collective experiences. It is important that we remain mindful of the power that these visions and representations have for artists and communities. JH: As an art curator, I was drawn to photography of the original murals, preparatory sketches by the artists, and influences of other artists, art styles, and artworks. 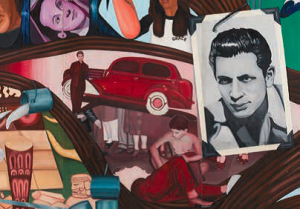 Photography, in particular, of Chicana/o murals is a crucial means of documentation. But, I learned, it is only one important way to uncover the stories of Chicana/o murals. When combined with correspondence, press coverage, oral histories, city records, and the artists’ own recollections, we can properly contextualize these works as events in time and space. GL: As an art historian, I had long been committed to giving artists a voice in my research by carrying out interviews and oral histories and interspersing those accounts into my academic arguments. I also understood the importance of individual narratives within the larger scope of arts and activist movements. Moreover, I was patently aware that their voices were silenced on various levels in our society. Our emphasis on individual mural stories worked to highlight the muralists’ unique perspectives. What murals are featured in ¡Murales Rebeldes? 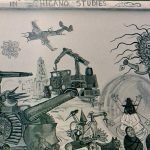 EC: Barbara Carrasco’s L.A. History: A Mexican Perspective was painted in 1981 and censored the same year for scenes depicting the marginalization of minority populations. Filling Up on Ancient Energies by East Los Streetscapers (David Botello, Wayne Alaniz Healy, and George Yepes) was created in 1980 and bulldozed in 1988 by the property owner to make way for a parking lot. JH: Roberto Chavez’s The Path to Knowledge and the False University was painted in 1974–1975 at East Los Angeles College and whitewashed in 1979 by the same administration that commissioned it. Sergio O’Cadiz Moctezuma’s Fountain Valley Mural was painted in 1974–1976 and destroyed in 2001 due to its excessive decay over the years. Willie Herrón III’s The Wall That Cracked Open, which deliberately included his and others’ graffiti, was painted in 1972 and whitewashed in 1999 by the city’s graffiti abatement crews. GL: Two murals by Ernesto de la Loza are stories of disappeared and disappearing murals. Resurrection of the Green Planet was painted in 1980–1981 and is now deteriorating. El Nuevo Mundo: Homage to the Worker was painted in 1996 and destroyed in 2000. Resurrection is a mural that has been neglected over the years, while the story of El Nuevo Mundo reveals how murals can disappear when a building’s ownership changes hands. Yreina D. Cervántez and Alma López painted La Historia de Adentro/La Historia de Afuera (The History from Within/The History from Without), in 1995 to represent the role of ethnic populations in Huntington Beach’s history. Whitewashed in 2009, its destruction indicates that murals depicting the history of minorities are often not a priority when it comes to preservation. Why were they chosen over other works that were also disregarded? EC: We were looking for compelling stories that demonstrated the many different ways that murals can become imperiled. We chose examples of murals that were under siege–that were censored, erased, destroyed, damaged, neglected, and devalued. Whether these murals were subjects of controversy, disrespect, or economic or political pressure, it was the stories behind the whitewashing, destruction, and censorship that we gravitated toward. For example, some murals and their artists, such as Filling Up on Ancient Energies by East Los Streetscapers, broke legal ground for other muralists in ways that are still significant today. JH: We chose murals based on certain criteria. Existing documentation was essential for us to be able to tell a mural’s story, including photography, the mural’s commissions and public reception, and the artist’s original intent. Another critical factor was the artist’s (or heirs) willingness to support our research and writing. GL: Most of the murals featured in ¡Murales Rebeldes! are no longer in our midst, but they speak eloquently of Chicana/o artists’ conviction to preserve the city’s mural legacy, one that honors Los Angeles’s most marginalized populations. Our project tells the stories of only a few of the many Chicana/o murals that have disappeared. The artists we feature are not the only ones who have seen their work destroyed or neglected. How is the ¡Murales Rebeldes book different from an exhibition catalogue? 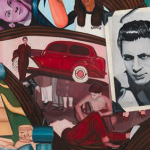 EC: Very early on, we realized that the book could expand upon the exhibition’s exploration of the political, social, and cultural aspects of Chicana/o murals. It also could reach a larger audience locally, regionally, and nationally—not just those who were interested in the subject matter, but those who could not come to see the exhibition. JH: As we began our work on the book, a colleague suggested that it would allow us to “resurrect” lost murals. That concept stayed with me throughout the process and gave our work urgency. I felt we had a mission. In the book, we could bring these murals “to life” with more visuals than we could display on the gallery walls and share more of each mural’s unique story. The challenges involved in “re-creating” on museum walls some of our murals that no longer exist could be compensated by the larger number of illustrations—over 175—that are featured in the book. GL: I had not contributed to an exhibition catalogue before, but having the opportunity to write essays for a wide audience about these murals and the contexts in which they arose and were painted was extremely appealing to me. As academics, we don’t often get a chance to reach audiences outside of university settings or make our research accessible to general audiences. Does the Chicana/o community still express itself with murals? EC: There are Chicana/o muralists working today, but the not to the extent seen during the period covered in the project. It’s important to remember, though, that historic murals are still present and still are vital parts of the communities where they were created. They are powerful expressions of community history and pride, and their political and social critiques are frequently still relevant. JH: I agree that the heyday of Chicana/o muralism is past. That is one of the reasons that this project is so important. We are documenting a period that is waning. GL: Because of the limitations and restrictions placed on the creation of public art, Chicanas/os are relying less on murals as vehicles for self-expression and more on other forms of art, such as smaller scale painting and drawing, performance, and literature. The heyday of Chicana/o muralism is certainly behind us, but I am optimistic that the future could bring us another golden era of Chicana/o public art. This is a population that is irrepressibly resilient and creative. What is the status of Chicana/o murals today? EC: The status of Chicana/o murals is highly uncertain. The threats to murals that we highlight in ¡Murales Rebeldes! are still present. However, organizations such as the Social and Public Art Resource Center (SPARC) and Mural Conservancy of Los Angeles (MCLA) are working to protect, conserve, and restore historic murals, as well as support the creation new artworks. The recent passage of a mural ordinance in Los Angeles, which provides a legal path–albeit a complicated one–for the creation of new murals, is also a generally positive sign. JH: The mural ordinance does protect murals but it has also put in place a vetting process that can be intimidating or even an obstacle to murals being produced. So yes, it’s complicated. I’ve also heard from business owners who now don’t want to allow a mural for fear they will never be able to remove it. 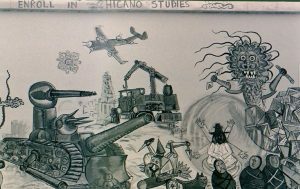 GL: In spite of the important work of SPARC and MCLA, Chicana/o murals remain under siege. In other words, Chicana/o muralism is still an endangered art form. It is my belief that we all have a responsibility to promote greater awareness and appreciation of Chicana/o art. Where are the mural hotspots in L.A. if someone wants to visit murals? EC: The East Los Angeles area is definitely a mural hotspot for Chicana/o murals: Silverlake, Estrada Courts, Boyle Heights, and City Terrace. Also, Judith F. Baca’s The Great Wall—half a mile long—is located in the Tujunga Wash flood control channel in the San Fernando Valley. JH: It is really fun to walk through downtown Los Angeles on a mural tour. Elloy Torres’s The Pope of Broadway is one of my favorites. And of course we have a recently revived stretch of murals that were painted for the 1984 Olympics along the 101 freeway downtown. GL: Orange County’s Chicana/o murals can be found in Anaheim, Placentia, Orange, Fullerton, and Santa Ana. Do murals sometimes say “too much?” Should the content of murals be edited? EC: I think it’s important to shift the focus away from whether a mural says too much and toward who has decided that a mural says too much. We need to look at the power structures in place in our city and country, for whose benefit they exist, and why those people have found murals threatening. For example, Barbara Carrasco’s L.A. History: A Mexican Perspective challenged authorities with an interest in suppressing uncomfortable but true aspects of the city’s history in favor of a more triumphant narrative. It spoke truth to power. In my opinion, there is almost no way a mural like this can say too much. JH: Would you ask Picasso if he went too far with Guernica? Or Siqueiros with América Tropical? We are a country built on free speech and we value individual self-expression. Public art is always subject to critique and there is always the risk that a mural will not be accepted or will offend. But making art by consensus is worse. We have to make space for our artists to speak and trust that most of the time we will end up with an artwork that is good and meaningful. GL: I think muralism is at its best when it evolves from a collective process whereby muralists consult or consider local communities in some way before their images go up on a wall. It’s not constructive when artists insert themselves into an urban space and impose their individual visions of the world on the wall. During this collective process, there will be some editing and negotiation of images and content. After all, these are the communities that will live with the murals on a daily basis. But once this collective process has produced an image that reflects the will and the spirit of a community, it is not right to subject it to censorship and destruction. Such actions stunt the possibility of public dialogue and silence the voice of communities. We are currently living in politically difficult times when the rights of many populations depicted in murals (including the residents who live in close proximity to these works) are under attack by the current administration. The hateful rhetoric of Donald Trump and other politicians tells us that Chicanas/os, Latinas/os, and other people of color are not legitimate citizens of this nation. A healthy and uncensored community mural scene can be an important lifeline to these communities that themselves are under siege.